Our Thanksgiving Feast For Two was lovely! After lunch, we made the sausage stuffing. We did not use a recipe. 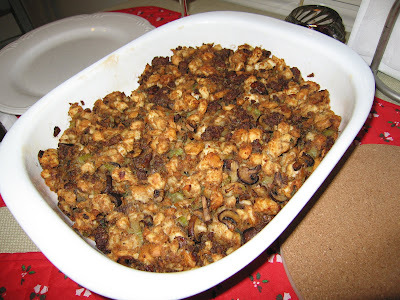 This was our version of stuffing based on family word of mouth and what we remember of our family stuffings from when we grew up. 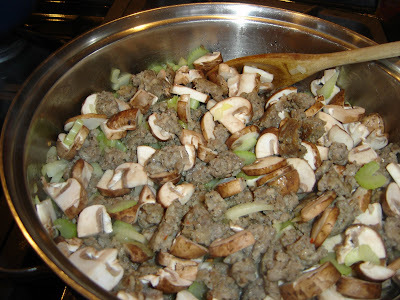 I insist on sausage stuffing - to me, there is no other. 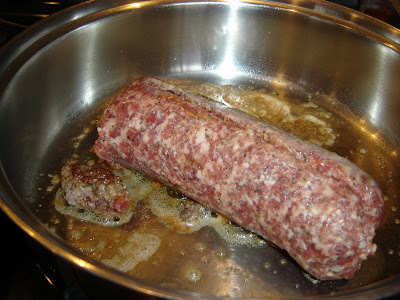 Stuffing must have sausage. For the bread cubes, you can buy bread and toast it in a toaster or oven, or leave the bag open and let it go stale, or buy stuffing/crouton bread cubes at the store. This year, we bought Cellone's croutons. We always add celery and onion. 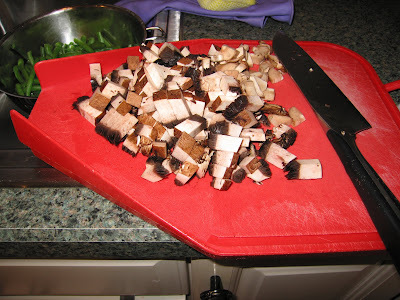 This time we added crimini mushrooms as well. Here's everything cooking in the big sauce pan: Our seasonings: pepper, poultry seasoning, fresh chopped sage, and a dash or two of nutmeg. For years my grandma would joke to me about her 'secret ingredient' in the stuffing and one year she told me that her 'secret ingredient' was a dash or two of nutmeg. And of course we added chicken broth. Yum!!! The final result: We love green beans so we made a green bean casserole. 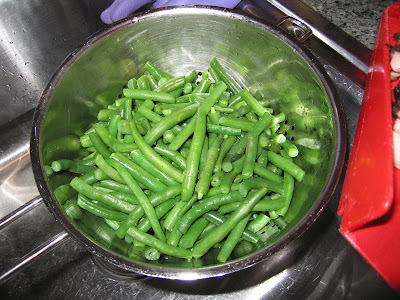 At first I just wanted steamed green beans but then I saw this recipe on Food Network. We decided to loosely follow it. It called for portabellas and green beans. 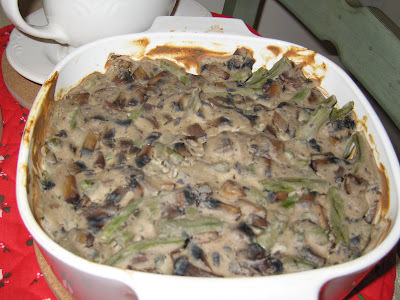 We blanched the beans, sauteed the onions & portabellas, combined all the veggies with sour cream in a casserole and baked it. We did not add the mozzarella or crushed corn flakes. It was delicious! 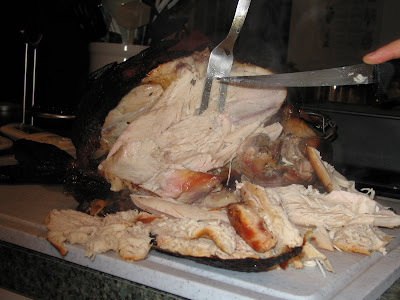 The final casserole: The main dish: turkey! 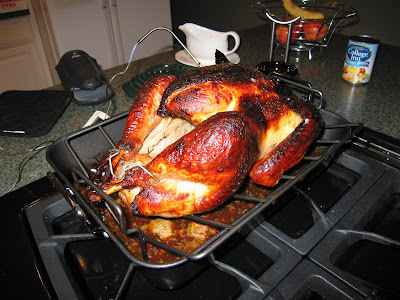 While I sauteed the stuffing sausage and vegetables, SP made the lemon butter and rubbed it on the turkey. 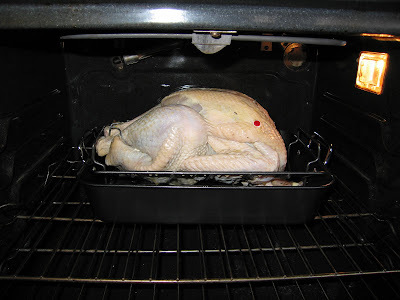 Here's our turkey going in the oven: It took a lot longer than we expected for it to not have any cold spots - almost an hour longer!!! We let the skin get so dark because I don't eat it and SP eats only a bit of it, so it didn't matter if the skin got too crispy. 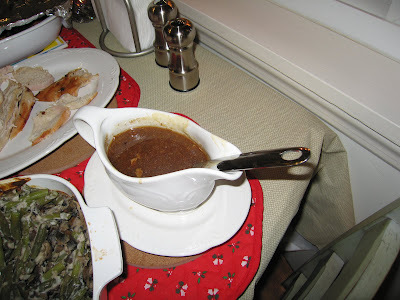 Here it is out of the oven: Of course we made some gravy: SP also ate a baked yam. With our delicious meal we enjoyed a lovely Coppola Sauvignon Blanc. Actually, I think we enjoyed the wine before the meal! 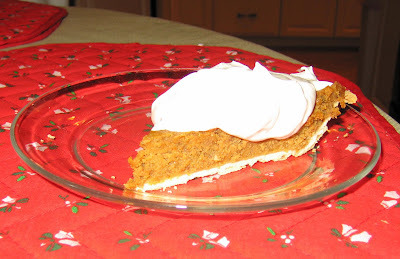 Dessert was the Pumpkin Mascarpone Pie that we made Wednesday night. After we cleaned up the turkey mess, SP made the topping. 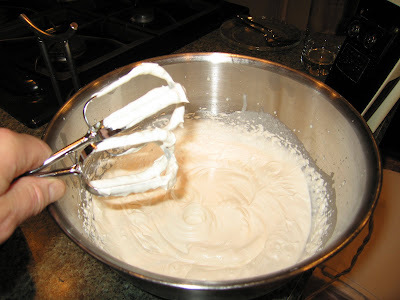 He beat together whipping cream, mascarpone, vanilla, and sugar. A very tasty pie - I'd definitely make this again. I liked it a lot more than regular pumpkin pie. 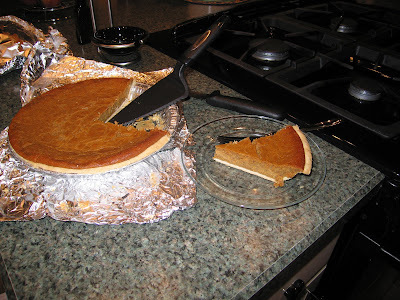 I wish I hadn't been so full, I would have liked to eat more than one piece of pie!!! And then we sat on the couch feeling stuffed!! A very nice Thanksgiving.